Whether you are an automotive parts seller or you just want to make a profit by selling the tires, the rims or any other part of your old car, you will need to find a trusted courier company to handle the shipping process. And that is when Eurosender might come in handy since it only cooperates with renowned logistics service providers who know how to ship such heavy and oddly shaped items safely. At the same time, you should keep in mind that the best way to ensure a safe transit of your car parts is by taking your own safety measures as well. Follow the packaging guidelines that we have gathered for you and learn how to pack car parts for shipping. How to place an order for car parts shipping? Get informed on how to pack car parts for shipping. Eurosender will take care of your order by arranging the shipment with a trusted logistics service provider and you will be able to enjoy the convenience of door-to-door delivery at much lower prices than you are used to. Any shipment booked through Eurosender is automatically insured for the amount up to 200€. However, we always recommend purchasing additional insurance for expensive items such as car parts. Additional insurance of up to 1000€, 2000€ and 5000€ can be added at a very low extra price. If you are planning to send a large number of car parts or car parts with big dimensions, such as a car door, we can provide you with a tailored offer based on your specifications. In case you have any remaining questions about shipping car parts such as tires and wheels, rims or exhaust pipes, you can contact our customer support team and our specialists will be more than happy to assist you. Choosing the right courier service is of great importance when shipping car parts abroad or across the country. 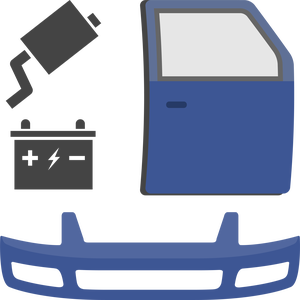 Eurosender has helped many people ship their car parts in Europe, whether it was about selling something or buying some spare parts from abroad. Measure the dimensions of your parcel accurately by using our Shipment Size Checker, to see what type of shipping your items qualify. Check with us if the courier will bring the shipping label or if you have to do it yourself. This depends on the pick-up country as well as the type of shipping service. If you plan on leaving the pick-up location, choose the collection date at least 2 days prior to your departure or have someone else appointed to hand over the parcel to the courier. Cardboard boxes – can be found in any stationery or hardware store or you can get used ones in supermarkets. Foam wrap – for extra protection. Packing peanuts – for internal cushioning of the cardboard boxes and filling the space between the item and the box. You can buy them at hardware stores. Polystyrene sheets – for additional internal cushioning. They can be bought at various hardware stores. We have prepared an exhaustive list of the main hardware stores in Europe to get some suggestions for your country. Put the car part in the box. Place the item in the appropriate box. For bare metal items, such as rims, we recommend taping pieces of corrugated cardboard around any sharp edges. Wrap individual auto parts. Protect any individual parts with bubble wrap or padded foam sheeting, especially components that must be disassembled first. Put small items in plastic pouches. Secure with an appropriate filler. Use anti-static packing peanuts and foam wrap to avoid any extra damage. Seal and label the box. Use adhesive tape to seal the box. You can label it with a sign saying “Fragile” or “Handle with care” and also specify the type of item that is inside the box. However, note that such a warning cannot guarantee that the package will be treated as such and should not substitute adequate packaging. Make sure to drain and empty any lubricants or liquids from used car parts to prevent leaks. A soggy box cannot protect your items. We strongly recommend you to keep the invoice for the items you want to ship. This serves as a proof of the item’s value and is therefore required by the courier company if you start a claim procedure following your shipping. Selling automotive parts. Many of our customers are regular automotive car sellers who benefit from our competitive prices. Making profit out of an old car. A lot of people choose to sell individual parts of their old car online. In this case, shipping the items directly to the purchaser has been the best choice. Buying spare automotive spare parts from sellers abroad – Certain types of car parts can be found in dedicated stores abroad and the buyer has to organize the delivery himself. In such cases, Eurosender can help the buyer find the best shipping service according to their standards. If you have any questions left concerning how to pack and ship car parts by courier, do not hesitate to get in touch with our experienced customer support team. Our specialists will be happy to assist you at any stage of the shipment process.